Yesterday, I added a new puzzle to our puzzle table. We're currently working on a Valentine's project that involves creating a Valentine for each teacher/staff member (total of 26) who works in our building (a combined middle school/high school). So, the puzzle table has been doubling as an arts/crafts table. If you look closely in the photos, you can catch a glimpse of how our Valentine's project is coming along. 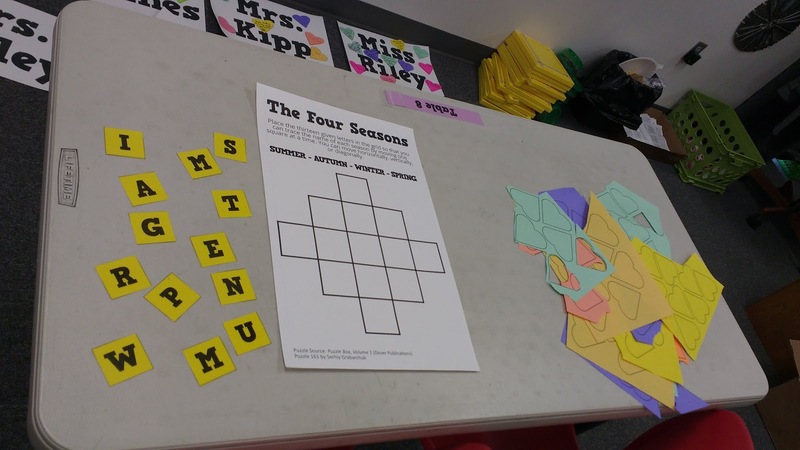 This puzzle is similar to the North, East, South, West puzzle from several weeks ago. I've decided to refer to this specific puzzle as "The Four Seasons Puzzle." This puzzle can be found in Puzzle Box, Volume 1 (affiliate link). This specific puzzle is by Serhiy Grabarchuk. 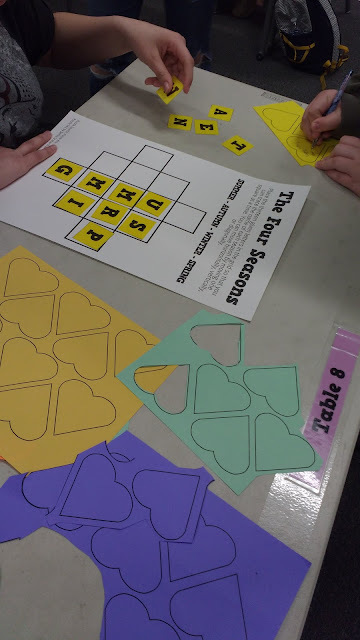 Students are given a puzzle board (printed on 11 x 17 cardstock) and a set of letter cards (printed on letter sized paper and laminated). 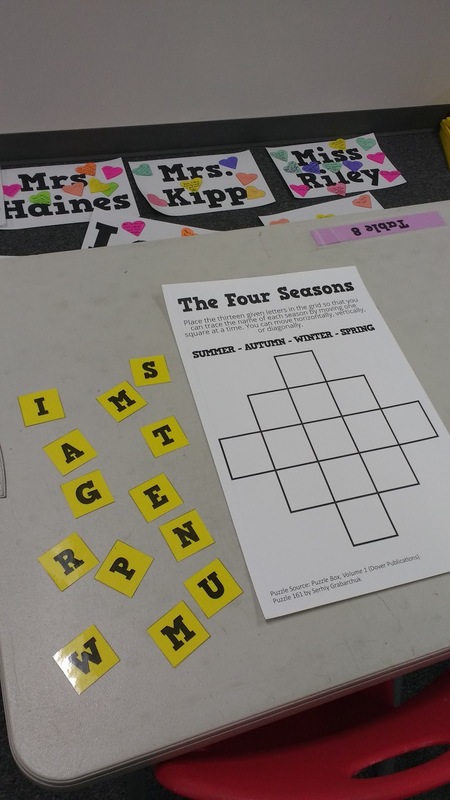 The goal of the puzzle is to place the letters in the grid so that the name of each season (summer, autumn, winter, and spring) can be traced out by moving one space at a time, vertically, diagonally, or horizontally. One of my students who makes sure to check out the puzzle on the puzzle table every single week made sure to tell me that this week's puzzle was the first in a while that she had been unable to solve on the first day. I have uploaded the files for this activity here. The puzzle board is designed to print on 11 x 17 paper or cardstock (affiliate link). The puzzle pieces are designed to print on letter sized paper. You can print it on letter sized paper by changing the scale percentage. I had to scale it to 65% to make it fit. Be sure you remember what percent you chose because you will need to scale the puzzle pieces to the SAME percent so that the puzzle pieces fit on the puzzle board properly. I hope you and your students have fun with this puzzle! If you haven't already, I definitely recommend that you check out the Puzzle Box books. You can get a great taste of what types of puzzles they have to offer you and your students by looking at the free Amazon Preview! Just click the "Look Inside" button for each book. If you're logged into Amazon, you can click "Surprise Me!" on the left side of the page. This will let you see quite a few of the puzzles inside the book for free. I typed up my first Puzzle Box puzzle from the free preview. Then, I did some more looking around and knew I had to order it! 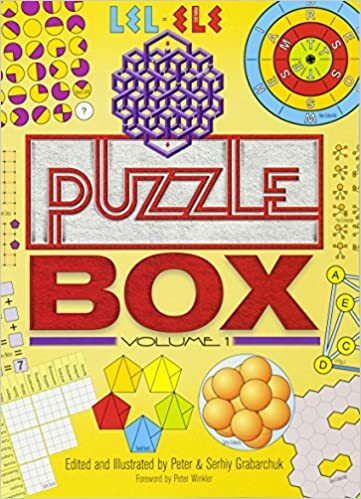 Full Disclosure: I purchased Puzzle Box, Volume 1 with my own money. I was sent a free copy of Puzzle Box, Volume 2 and Volume 3 by the Grabarchuk Family. We can't solve this (day three). Any hints? My kids have concluded this is impossible. Surely not? Any hints? There are probably eight solutions, because of reflections and rotations of our solution. In Audrey’s solution, here’s a hint. The top row is just the letter A, and the next row is G, then M, then U.